Have you ever had one of those stories that just grabs your attention and won't let go? 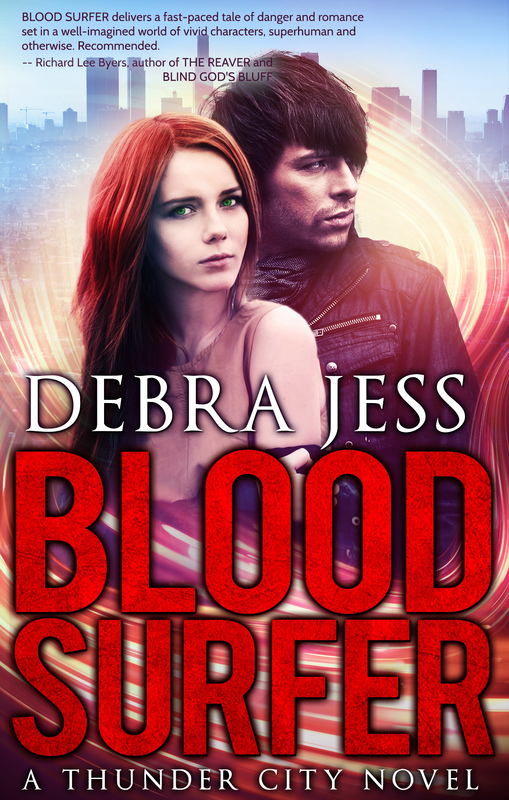 Well, Blood Surfer was just that kind of story for me. We meet the hero first, just before he is tossed out of a helicopter - one that is airborn. Then we meet the heroine, who just happens to have abilities that allow her to save the hero's life. Then comes the question of who is more dangerous. The ones they were running from, or those who they turn to for help. 3 Q&A - One question each for Ms Debra Jess, Scott Grey and Hannah Quinn. Ms Jess - I found this storyline to be so unique. Can you share where you got the idea from? The first image I had after I decided to write a superhero novel is the opening scene of the book - a man falling out of a helicopter. Of course, from there I had to figure out how to rescue him. Who would be powerful enough to do it in an interesting way? Having a hero who could fly would work, but it would also be boring. Maybe have a hero catch him telekinetically in the air? Nah - too simple. That's when my evil twin whispered in my ear: why bother saving him? Let him go splat. Okay hot shot. Now how are you going to rescue him? From there I built the character of Hannah Quinn, a bloodsurfer who could heal anyone of any injury. She can travel through the human body. As she surfs through your arteries and veins, she can stitch broken bones and destroy bacteria and viruses lickety-split. Scott - You have a reputation as unfriendly to Alts. Alts perform heroic feats. Why did you chose a career as a police officer which some might consider a Norm's chance at performing heroic feats, when you could have chosen one that was more "Norm"? Well, that's easy. I enjoy helping people, but sitting in a cubicle all day long isn't active enough for me. I had been working for my father's cyber-security company part-time after school. I could've stayed there and climbed the corporate ladder from a cubical to the corner office, but I wanted to be my own man. I needed to prove I could be more than just my father's heir apparent. When I heard that Miranda Dane, the mayor of the city across the bay, had lowered the minimum age requirement of the police academy from 21 to 18, you bet I took advantage of the opportunity. Of course, if I had known what Miranda Dane was really up to when she lowered the minimum age, I wouldn't have gone anywhere near the academy. But then, I never would have met Hannah. Hannah - Alts are born with their abilities. If you had been give a choice, would you have chosen to be an Alt, and if so, would you have chosen the ability you have, or another? Oh, wow. I really need to think about my answer. I guess I would still choose to be an Alt because I really do like helping people. Captain Spectacular is my hero and all my life I've wished I could be just like her. If I could have chosen a different mother, though, it would have made the choice to be an Alt much easier. If I had known Miranda was going to be the one raising me, I might have chosen to be a Norm - if that makes any sense. And if I could choose my own power? Well, I still think bloodsurfing is the best power for me, but I wouldn't mind being able to fly too. Rumble took me flying once and it was amazing. Another time, Ghost took me through the Blackwood home with his power. It was almost like bloodsurfing except we traveled through wood and concrete instead of arteries and veins. I wouldn't mind having his power as well. I truly enjoy sharing my love of reading. This site was started to allow me to share some of my favorite books. I hope that if you look around and find that you agree with some of my selections (see my reviews), that you will return and hopefully find new authors. I plan on having periodic "Recommended Reads" lists that will include books I recommend, as well as suggestions by visitors to this site. I will also keep you up-to-date on different upcoming events, special offers, etc. As you look around, I'm still learning my way around HTML, etc. If you see any errors, typos, please e-mail me. Boy Meets Girl, They Fall in Love, and the two of them live Happily Ever After. This is the content for any book I believe is a true Romance Genre novel. The books that I recommend, or have reviews posted for will follow that format, unless I note otherwise. Granted we may know the outcome of a Romance Genre Novel, but it is the journey the characters take that is the reason we read these books. The Happily Ever After doesn't mean they're all vampires... Just means that the future is open to them, even if it is set 500 years in the past - we don't need to know their final chapter in life. At times I have have Recommend Reads by visitors to this site - I cannot guarantee that they meet my criteria for a Romance Genre Novel.